Apple's new operating system gives users a way to use diacritical marks to write Hawaiian words correctly. UH-Hilo computer specialist Keola Donaghy recently displayed three similar Hawaiian words with different meanings. HILO >> "The life of the land is perpetuated in righteousness," says the state motto when translated into English. But in Hawaiian, it also can be read as "the life of the meal is perpetuated in righteousness" or "the life of the crackling sound is perpetuated in righteousness" -- if it's written without the proper spelling marks. Now Apple Computer, Inc. has made it possible to write Hawaiian correctly, with the proper marks, on Macintoshes. The new Mac operating system 10.2, released at the beginning of the month, provides typefaces for the kahako, indicating long vowels, and the okina, indicating glottal stops. 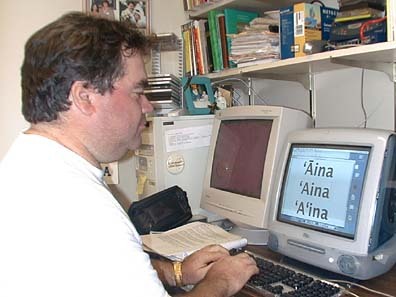 The two marks essential to the Hawaiian language became a reality in the newest Macintosh software partly because of computer specialist Keola Donaghy. Raised on Maui where he became familiar with computers at recording studios, Donaghy came to the University of Hawaii's Hilo campus and its Hawaiian language program in 1994. Some time ago, he got an Australian to adapt an existing product that can be added to computer systems to allow for the Hawaiian spelling. That system is still available for free at www.olelo.hawaii.edu/eng/resources/. Periodically, Donaghy also asked a friend at Apple to have marks included as part of Apple's operating systems. Apple ignored him until last year, then did a switch while working on Mac OS 10.2, known as Jaguar, which also includes fonts for Russian, Japanese, Chinese, and Korean. Computer systems manager and Hawaiian language editor Kaliko Trapp is enthusiastic about Hawaiian being part of Jaguar. "This is allowing us to buy it out of the box," Trapp said. "It's all about aesthetics. It just looks pretty," he said of Jaguar's Hawaiian fonts. And Jaguar is more reliable than previous operating systems. "It's like having a brand-new car with a brand-new engine in there," he said. "The thing just runs so sweet. It certainly makes working (on Hawaiian texts) easier." Only about 5 percent of computers in the country are Macintoshes, but the availability of Hawaiian fonts in them will eventually induce Microsoft and IBM to include Hawaiian capabilities in their systems, Donaghy predicted. Text programs by Adobe and other companies will eventually include the fonts, he said. "The significance isn't for today but for the coming years," he said.